Some thoughts on Guardians of the Galaxy (both movies), and why they’re not as outside the box as they seem. Spoilers for the second movie to follow. Heteronormativity is alive and well in the MCU, and very noticeably in the GoTG movies and their main couple, Gamora and Peter Quill. ~Feelings~ develop in the first movie for no discernible reason except that an attractive man and woman are within 20 feet of each other. This is, I suppose, a plausible, if now painfully overused reason that two people can be take an interest in each other; what bothers me more is the development of their relationship. We are shown these two characters caring about each other, nearly sacrificing their lives for each other – but with no buildup, no plausible reason why they are suddenly so important to each other – other than that they’re the only conventionally attractive heterosexual couple possible within the main characters. Quill is supposed to be something of a serial womanizer, and we see his interest in Gamora the moment he sees her. But why is she more to him than all the other women? Why, for that matter, does Gamora have feelings for him? Even if they care about each other, why isn’t it just platonic? Ironically, in following the heteronormative script, it’s not just LGBT characters and non-traditional relationships that lose out – heterosexual characters and relationships are also deprived of nuance by following the formula. Then, in the second movie, there’s an “unspoken thing” and Gamora just needs to open up and here I am, watching, and wondering to myself who these characters are. 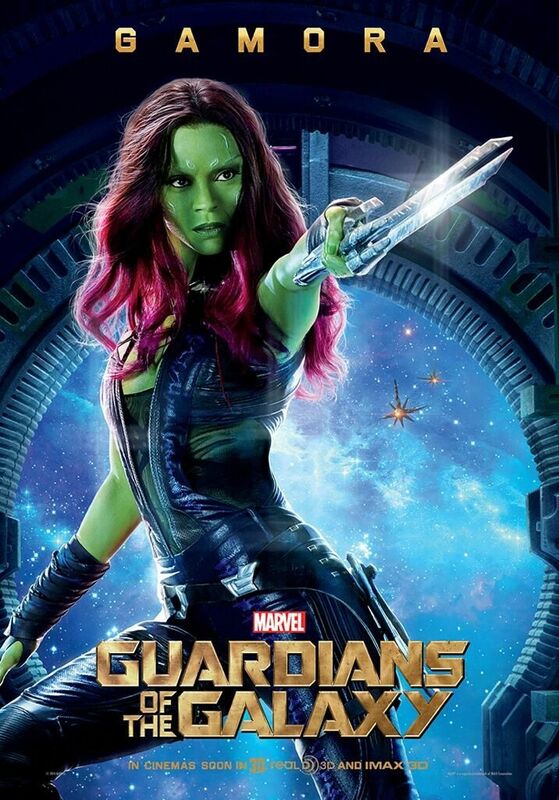 In the first movie, Gamora is shown to have an incredibly strong moral compass and sense of self. Unlike Nebula, who is very damaged, Gamora has an innocence about her. When she hears that Ronan is planning to wipe out an entire planet in the first movie, she rebels, no questions asked. She pleads with the other Guardians; Ronan is going to destroy Xandar, and he has to be stopped; to her, there is no other option. Gamora is passionate and caring, and to me, it makes no sense that she’s suddenly this wilting flower, denying any feelings for Quill. If anyone would have trouble with feelings, it would probably be Quill, the serial womanizer who forgets women’s names because that’s how little he cares about them. The consistency and depth of both characters gets undermined. This is hardly the only part of the franchise that’s formulaic, just the part that irritates me the most. Ronan is also a very stereotypical and unintimidating villain – though they did a bit better with Ego in the second movie, even though the end fight was sort of dumb and all over the place. Even the main plot – Quill resolving his daddy issues – feels sort of weird, because there are all these other (arguably more important to the larger MCU plotline) plots going on that don’t get nearly enough screentime. Gamora and Nebula get a couple fights and then a weaksauce “I just wanted a sister” resolution that comes sort of out of nowhere and doesn’t address the major issues the two of them have. Mantis doesn’t get a plotline at all, unless you count being insulted by Drax, despite the fact that she suffered comparable trauma to Rocket and Yondu, and a plotline about her would have fit well into the overcoming your past/found family arcs. And because of her lack of development, her big moment where she fights back against Ego doesn’t feel big. Also, despite the fact that it passes the Bechdel test (yay, the bare minimum), every female character seen is thin and conventionally attractive, and all of them wear very similar form-fitting outfits – and in the first movie, Drax addresses Gamora as a whore for no perceptible reason except to get a laugh. Which is not only sexist, but makes zero sense because…it’s not like she’s known for being a femme fatale. She’s an assassin. All of these problems (and more, but I can only rant so much before I get tired) spring, I think, from one major issue: the GoTG movies aren’t quite sure what kind of movies they are. They hover uncertainly between glitzy action movies, and dark, black comedy satires of superhero movies. This causes a bunch of problems. For one, there’s an attempt to give female characters more screentime and agency, but it never really follows through. (Forget about LGBT characters; we got our two minute moment in Beauty and the Beast and we better be grateful, dammit!) For another, it lowers the stakes, making the villains, especially Ronan, really ineffectual. It’s hard for Ronan killing a bunch of people to feel like a big event when all the characters (including the protagonists) cause a lot of fatalities that are played for laughs. A lot of the jokes feel out of place for the more serious, action movie plots – and the serious stuff often falls flat because it’s constantly undermined by the self-referential, self-mocking humor. But of course Disney can leave no demographic unmarketed-to, and so it remains a weird hodge-podge of genres and storylines. But other than that stuff it was pretty good.